Part of KARA’s structure of management are thematic-based committees composed of professionals in diverse fields who volunteer their time to contribute to the realization of the Alliance’s goals. A research by the Oversees Development Institute (ODI) and the World Resources Institute (WRI) has found that 65% of the people who die on the roads in Nairobi’s are pedestrians. The KARA Annual General Meeting was held on 29th March 2018 at the secretariat offices. According to the National Treasury, there is no cause for alarm as far as Kenya’s public debt is concerned. Mombasa residents have expressed concerns over the slow pace of development in their County. Kara is set to host its Annual General Meeting (AGM) on 29th March 2018 from 9am to 11am at the secretariat offices. Kara participated in a multi-stakeholders forum convened to establish the Kenyan National Platform for Partnering for Global Goals and Green Growth (P4G). Nyeri County Government has committed to partner with Kara in development of Solid Waste Management Policy and Bill for the County. Kara participated in the recently concluded Governance Summit organized by The Institute of Certified Public Secretaries of Kenya (ICPSK) and HESABIKA under the theme ‘Good Governance for Good Citizenship. Urban Planning experts have advised that meaningful development and service delivery in Kenya’s urban areas will only happen if there is structured engagement of citizens in decision making processes. 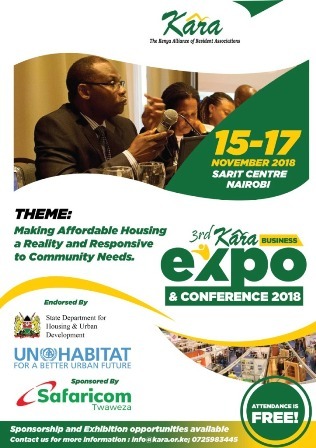 Kara participated in the National Urban Forum (NUF) organized by the Ministry of Transport, Housing and Urban Development and held on 15th – 16th January 2018 in Nairobi. The year 2017 has been quite eventful not only for Kenya but also Kara. The prolonged political climate impacted on a number of plans we had for the year. Nonetheless, with your unwavering support we were still able to record a number of milestones aimed at enhancing access to quality service delivery. 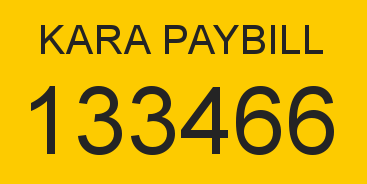 Thank you for your partnership, friendship and support.